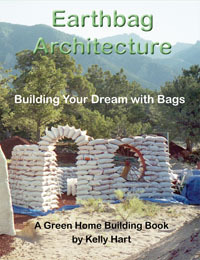 Building with earthbags (sometimes called sandbags) is both old and new. Sandbags have long been used, particularly by the military for creating strong, protective barriers, or for flood control. The same reasons that make them useful for these applications carry over to creating housing: the walls are massive and substantial, they resist all kinds of severe weather (or even bullets and bombs), and they can be erected simply and quickly with readily available components. Burlap bags were traditionally used for this purpose, and they work fine until they eventually rot. Newer polypropylene bags have superior strength and durability, as long as they are kept away from too much sunlight. For permanent housing the bags should be covered with some kind of plaster for protection. 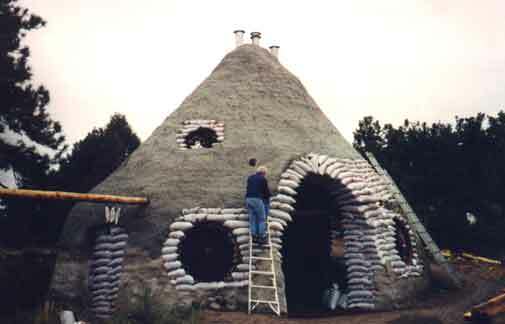 There has been a resurgence of interest in earthbag building since architect Nader Khalili, of the Cal-Earth Institute, began experimenting with bags of adobe soil as building blocks for creating domes, vaults and arches. Khalili was familiar with Middle Eastern architecture and the use of adobe bricks in building these forms, so it was natural for him to imagine building in this way. The Cal-Earth Institute has been training people with his particular techniques, and now the whole field has expanded considerably with further experimentation by his students and others. 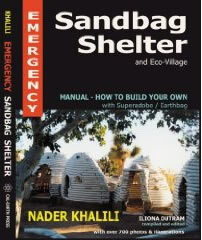 I have taken Khalili's ideas of building with earthbags that are laid in courses with barbed wire between them, and come up with some hybrid concepts that have proven to make viable housing. Instead of filling the bags with adobe soil, I have used crushed volcanic rock. 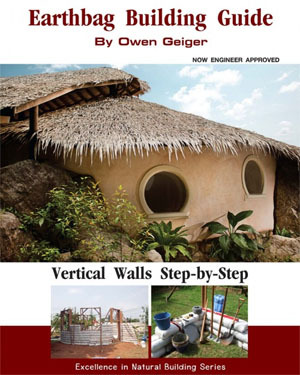 This creates a very well insulated wall (about as good as strawbale) that will never rot or be damaged by moisture. As a covering for the earthbags I used papercrete (see the papercrete page). This worked to seal the bags from the sun and the weather, without necessarily creating a vapor barrier...the walls remain breathable. But papercrete may not be sufficiently durable or a good choice in warm and humid climates because mold could form on it. The media shown below are arranged according to when they were published, with the most recent ones at the top. 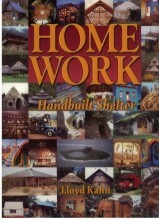 Other resources for earthbag building are also shown. If you click on one of the images you will be taken to a page at Amazon.com where you can find out more about the product. 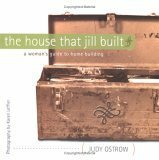 If you end up buying something, greenhomebuilding.com will receive a small commission that will help cover the cost of maintaining this website. Thanks for your patronage. 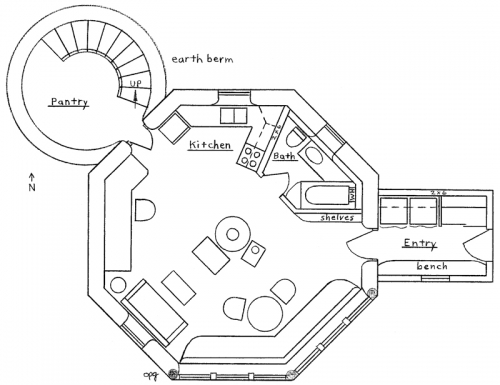 Specifications: 565 sf interior, plus 291 sf tower (4 levels) for a total of 856 sf; 1 bedroom (fold-out bed), 1 bath, plus cool pantry and 2 bonus rooms. 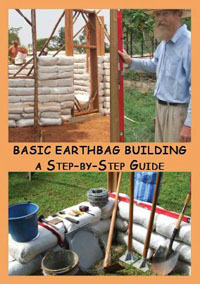 earthbagbuilding.com is absolutlely the most informative site about earthbag building, created by Kelly Hart and Dr. Owen Geiger. earthhandsandhouses.orgrun earthbag workshops around the world, based on real building projects: their next workshop is in Thailand in February 2014 and there will be one or more held in Europe in the summer of 2014.
homegrownhideaways.org conduct regular workshops mostly in Kentucky. phanganearthworks.com offers workshops in Thailand. naturalhomes.org lists workshops from around the world, some relating to earthbags. 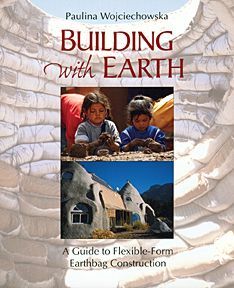 unitedearthbuilders.com provides educational and charitable services in regard to environmentally sustainable, affordable, and structurally sound earthbag homes. Espiritu y Lluvia : Centro de Permacultura y Bioconstrucción Aplicada. (Spirit and Rain: Permaculture and Bio-building Centre) located in Argentina conducts earthbabg workshops throughout South America. www.tsatsa-house.com has conducted workshops in India and Japan. 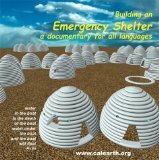 calearth.org outlines Nader Khalili's approach to building an emergency shelter. 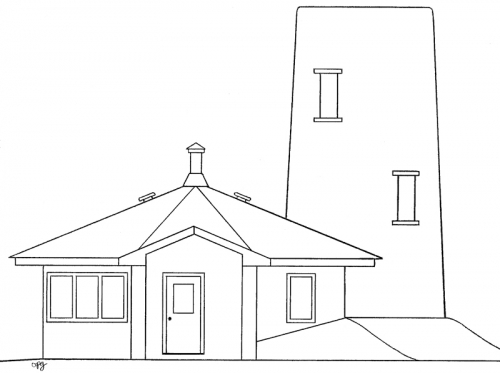 evolotecture.com builds eco resorts - villages and homes around the world based on self-sustainable earthbag/superadobe and straw bale building. 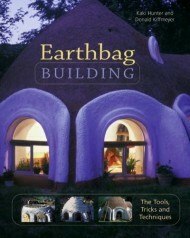 earthbagbuilding.com list many sources for bags and tubing material from around the world.